A new paper, co-authored by University of Notre Dame astrophysicist Joseph Bramante, discusses how detecting imploding pulsars may lead to insights about the properties of dark matter. The paper, “Detecting Dark Matter with Imploding Pulsars in the Galactic Center,” was recently published in Physical Review Letters, the flagship journal for the American Physical Society. 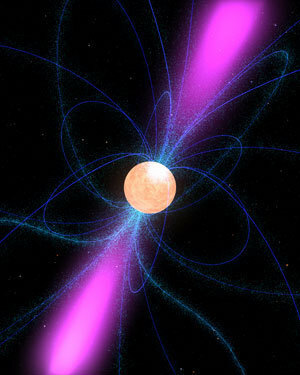 Pulsars, or pulsating stars, are rotating neutron stars that emit pulses of light visible to astronomers on Earth. Pulsars are created from the collapsing cores of supermassive stars that have exploded into supernovae. These supermassive stars, 10 to 40 times the mass of the sun, have been found at the center of the galaxy, leading astronomers to predict a certain number of pulsars should also reside there, but that predicted number of pulsars has not yet been observed. In the paper, Bramante and his colleague at the University of Chicago, Tim Linden, discuss how dark matter could explain the absence of pulsars in the galactic center. Dark matter, which makes up approximately 25 percent of the matter in the universe, is a very dense type of matter that does not emit a significant amount of light. A particular kind of dark matter could destroy pulsars at the galactic center by falling into the pulsars and forming black holes that swallow them. “Observations of pulsars imploding into black holes could provide important clues to the properties of dark matter, specifically indicating it is asymmetric, just like visible matter,” said Bramante. The paper also explains how the researchers showed that the presently unknown mass and quantum couplings of dark matter could be found by determining the age at which a pulsar is swallowed by a dark matter black hole. One predictor of this pulsar-collapsing dark matter is a maximum age for pulsars, which gets higher the further away from the galactic center the pulsars are because there is less dark matter away from the center. The next steps in this work for Bramante and his collaborators includes building and testing a model of dark matter to ensure the model meets all other cosmological and astrophysical dark matter observations. Originally published by Stephanie Healey at news.nd.edu on November 12, 2014.